Make sure you're ready for your next special event with table, chair, tent rentals and much more from our party rentals company in Brooklyn, New York. For more than 15 years, A-Z Party Rentals has been making sure you get all of the party equipment you need for every one of your special occasions or parties. We are the most professional , reliable and insured company in five boroughs. Our family-owned-and-operated party rentals company always carries the latest equipment at the best possible prices. We always make sure everything runs smooth and on time. Contact us at (718) 832-6503 to reserve your party equipment from our company today. 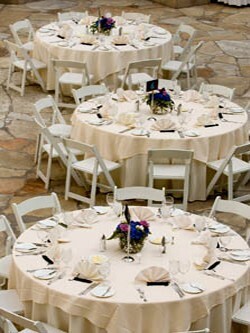 A-Z Party Rentals has white plastic folding chairs with padded seats and also white folding chairs with chrome or white frame. 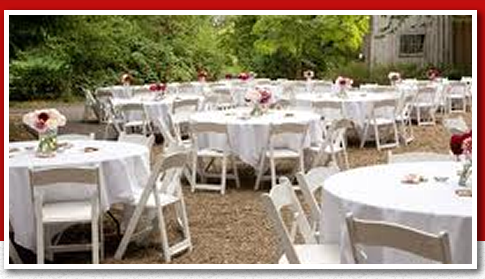 We can make sure that everyone that comes to your special event has a place to sit. There is no minimum or maximum to the amount of chairs you can rent. Additionally, we can negotiate the price of our chair rentals as needed to make sure you get the most for your money. A-Z Party Rentals has a variety of different tables for rent that come in a number of different sizes and shapes, including rectangle, square and round tables. There is no time limit on our table rentals, which ensures you can have them for as long as your event takes place. 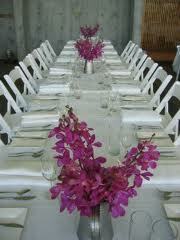 We also provide linen rentals for our tables by request and additional cost. 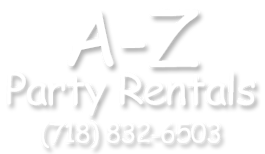 A-Z Party Rentals is a trusted provider of event rental equipment. Our experience and unsurpassed service allow us to create the perfect setting for any event ! * From backyard barbecues to elegant affairs, every event is handled with the same degree of attention and care ! We carry a variety of different tent sizes. Our tents are great for covering a food table, trade shows, small or large parties , or even to provide shade for a DJ or dance floor. All prices include set up and take down. Call our party rentals company at (718) 832-6503 today for competitive rates on our party equipment. Service Areas: Brooklyn, Queens, Bronx & Staten Island.